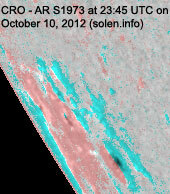 Last major update issued on October 11, 2012 at 03:45 UTC. 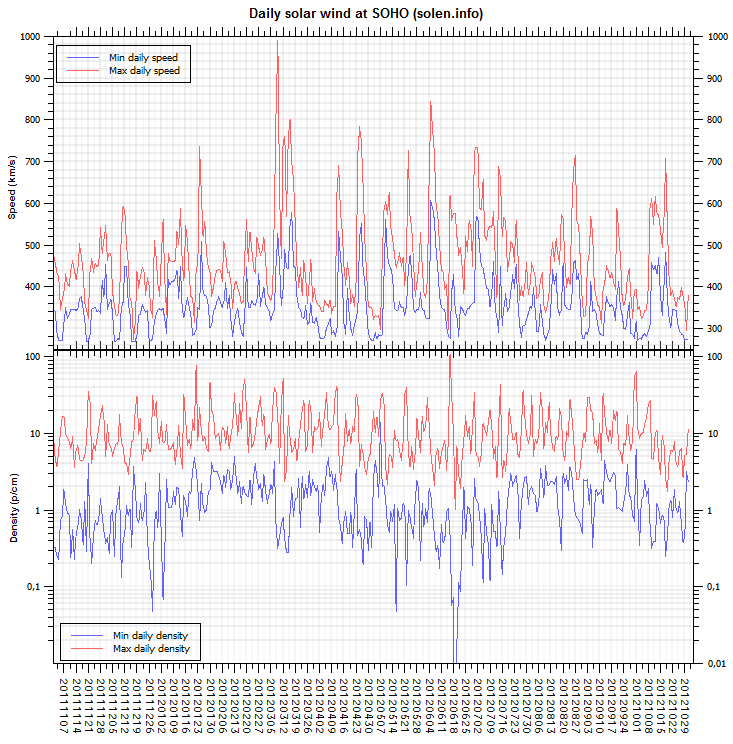 The geomagnetic field was quiet to unsettled on October 10. 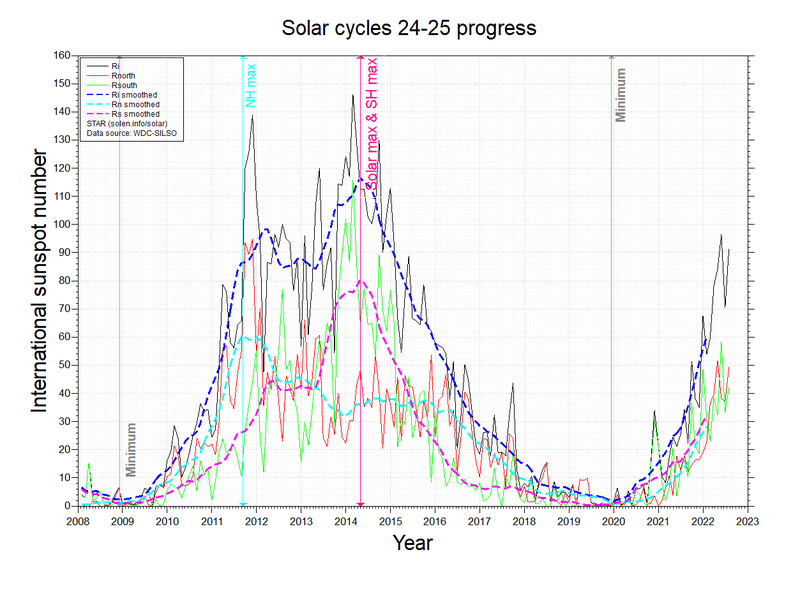 Solar wind speed at SOHO ranged between 454 and 610 km/s under the influence of a high speed stream from CH538. 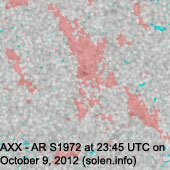 Solar flux measured at 20h UTC on 2.8 GHz was 112.0 (increasing 12.9 over the last solar rotation). 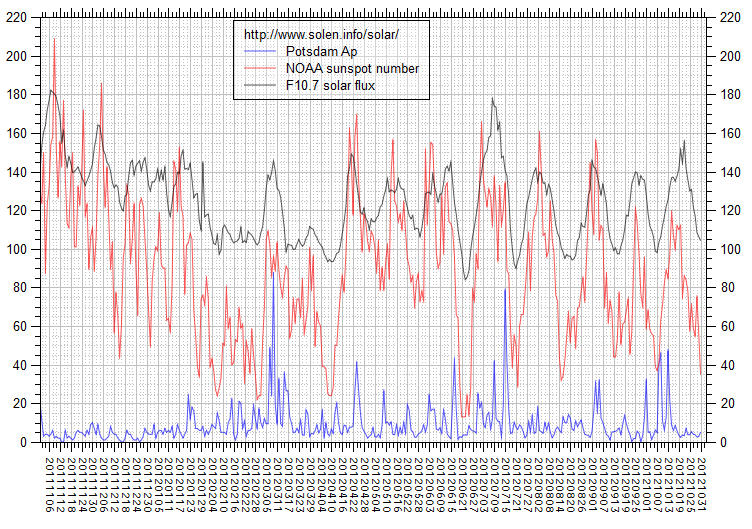 The Potsdam WDC planetary A index was 12 (STAR Ap - based on the mean of three hour interval ap indices: 12.3). 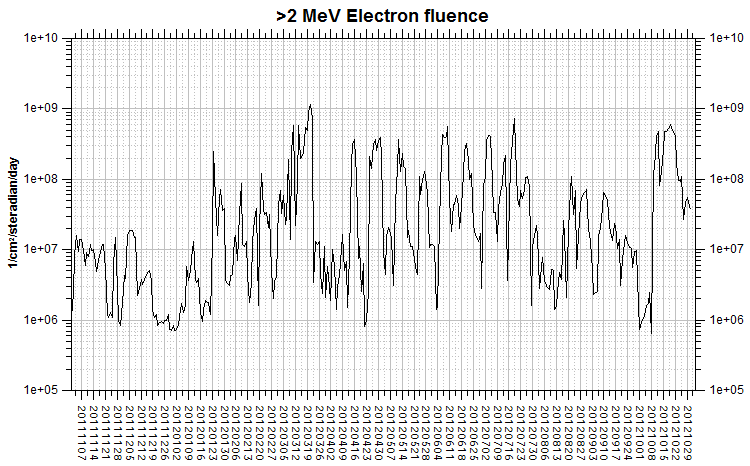 Three hour interval K indices: 33332332 (planetary), 32323332 (Boulder). 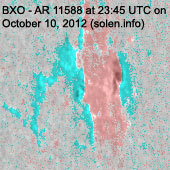 Region 11585 [S18W41] decayed losing penumbral area. 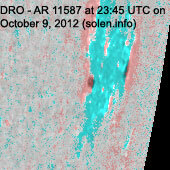 Region 11586 [S12E26] decayed slightly and was quiet. 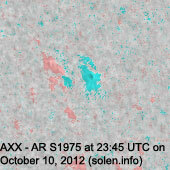 Region 11588 [N08W74] decayed slowly and quietly. 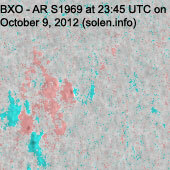 Region 11589 [N13E63] contributed to the M1.0 event peaking at 05:04 UTC and was otherwise mostly quiet. S1971 [N13W70] decayed slowly and quietly. 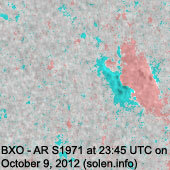 New region S1973 [S30E73] rotated into view with small spots. 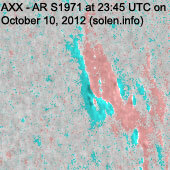 It is uncertain if this is the region that has been quite active over the last days or if there is another trailing spot group. 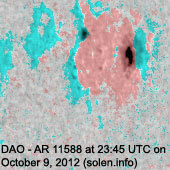 The largest event of the day was recorded as an M1.0 flare peaking at 05:04 UTC. 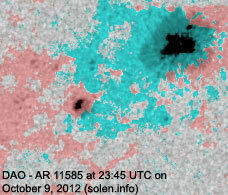 This event was caused by near simultaneous flares in this region and AR 11589. 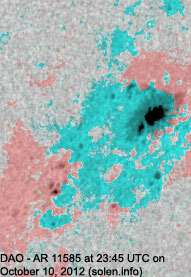 New region S1974 [S09W04] emerged near CH539 with a single tiny spot. 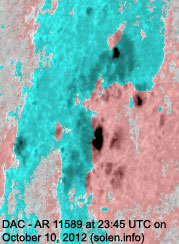 New region S1975 [N32W60] emerged with reversed polarities. 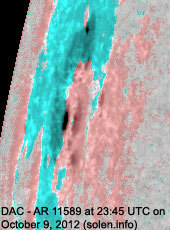 October 8-10: No obviously Earth directed CMEs were observed in LASCO and STEREO imagery. 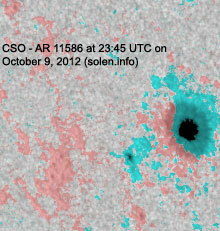 A recurrent southern hemisphere coronal hole (CH539) will rotate into an Earth facing position on October 9-11. 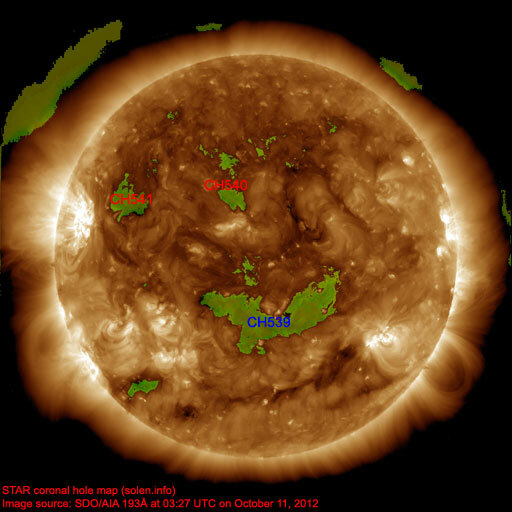 A coronal hole (CH540) in the northern hemisphere will likely rotate into an Earth facing position on October 11. 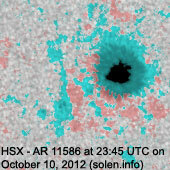 Another northern hemisphere coronal hole (CH541) could become Earth facing on October 13. 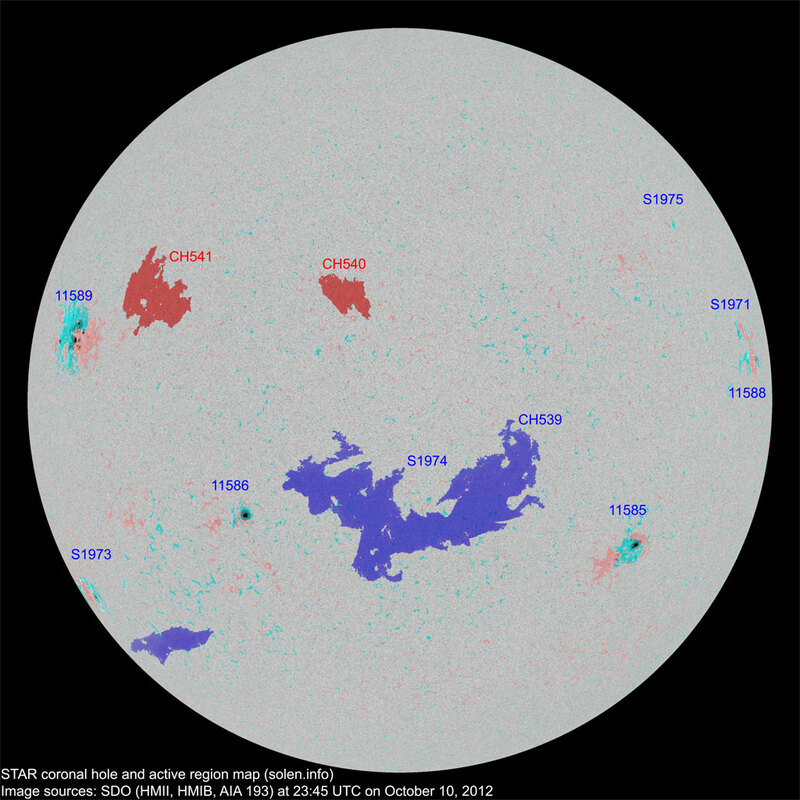 The geomagnetic field is expected to be mostly quiet on October 11. 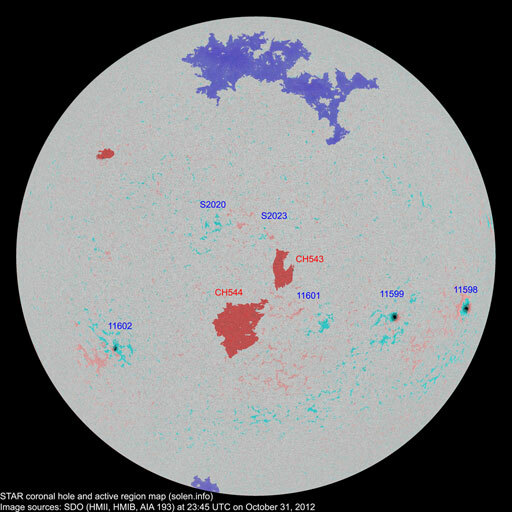 A high speed stream from CH539 could cause some unsettled and active intervals on October 12-15 with contribution from CH540 on October 14-15. 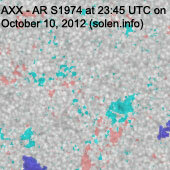 A high speed stream from CH541 could produce a few unsettled and active intervals on October 16-17.